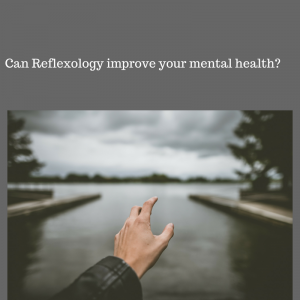 Can Reflexology Improve Your Mental Health? It was lovely to receive this feedback. I’m delighted the treatment made such a difference to my client’s symptoms. If left untreated, symptoms of stress or anxiety can become much worse and begin to affect your mental health. Every year on 10th October, the World Health Organisation holds Mental Health Awareness day. It aims to raise awareness of mental health issues around the world and mobilise efforts in support of mental health. With this blog, I hope to play my own small part. One in four of us will experience a mental health problem in our lifetime and 9 in 10 people say they have faced negative treatment from others* as a result. Stress and anxiety are a common symptom of many mental health disorders such as obsessive compulsive disorder (OCD), bi-polar disorder and depression. Reflexology is a complementary holistic therapy often used to manage mental health conditions. According to Ancient Chinese philosophy, energy flow blockages (build-up of toxins) in your body can cause of mental health disorders like depression. Reflexology treats the whole of the body, not just the hands or feet where the massage is expertly applied to pressure points. Every part of your body is connected by energy pathways, which end in reflex areas on the hands and feet. Regular sessions promote blood circulation to your organs, reduce toxins and help release stress that’s built up in your body. It’s a natural alternative to medication. One of the main focuses of mental health awareness day this year is on mental health in the workplace . About two thirds of people with mental health problems believe that long hours, unrealistic workloads or bad management either caused or exacerbated their condition*. It’s a sad fact that negative working environments and workplace bullying are becoming increasingly common. We all know someone who has a toxic boss or an impossible workload. While it can’t solve these problems, reflexology can help reduce stress levels, improve sleep and make you feel more able to face whatever challenges life throws at you. Reflexology treatments are renown for having a dramatic impact on sleep patterns. Many clients come to me suffering from sleep deprivation; some as a result of stress or worry, others because their children are simply keeping them up at night. When I check in with clients post treatment to see how they feel, they often report they slept soundly and longer than usual. If you’re living with a mental health problem you may find it difficult to get a good night’s sleep. This can exacerbate your condition. Reflexology induces a state of relaxation and promotes quality sleep. Over time, it can help you to establish a regular sleep pattern. Your body will also release endorphins, natural feel-good hormones that can minimise your body’s response to stress. I’ve teamed up with a good friend of mine, Penelope Marshall Silver, to add a new treatment to my portfolio – Rei-Flexology. Penny is a Reiki practitioner and together we take you on a journey of deep relaxation. This wonderful unique treatment leaves your soul energised and your feet feeling like you’re walking on a cloud. Feedback from clients has been incredibly positive and the relaxation is beneficial for mental health and wellbeing. I send a big hug and my very best wishes to all those affected by mental health disorders. I have the utmost respect for those who support people with these debilitating issues. I hope this blog helps start a conversation that makes a difference and perhaps changes the way you think and act about mental health.